March 2016 – I.C.A.R.U.S Inc. In my last article I focused on the narcissism of animal interactions, specifically the pay-to-play schemes run by so many “sanctuaries” which are not GFAS accredited. I also touched on those who glorify the handling of big cats, like Eduardo Serio and Black Jaguar White Tiger. I had intended to turn my attention on the various celebrities who propagate the public’s desire to hold and take photographs with captive wild animals, but Black Jaguar White Tiger has recently made such a textbook example of themselves in the matter of narcissism and hands-on interactions that it was impossible to ignore. In just the last few days, Serio has introduced not one, but two, new cubs to his followers. One of them is Gorakh, a white lion, who “came” to him from the same place where he also got Limubai, General, Slider, and Ghost. As Serio puts it, he is “a very lucky person to have friends that help me rescue these babies”. Or, from a more rational perspective, and since he refuses to ever disclose exactly from where he gets the cubs, or exactly from whom he gets them, he’s lucky to have such a steady supply of cubs which can so conveniently be “rescued”. But I digress. Gorakh (who was introduced to Serio’s followers one day, and put in with other cubs the next, without any discussion of quarantine or other precautions where the spread of zoologic diseases are concerned) is a seemingly healthy lion cub. The same cannot be said for the second big cat cub Serio so proudly introduced to his adoring fans. Achilles the tiger cub arrived at Black Jaguar White Tiger with four broken bones, two of them already incorrectly fixed with pins and fused permanently, and a slew of other internal problems, including intestinal issues. The cub was in profound agony. So what did Serio do? He videoed the suffering animal as it lay on the floor of the house where his cubs are kept, and posted it to his Instagram account, describing the horrific condition of the cub and how much pain he was in. Presumably after he’s done taking videos of your suffering and then posting them to the internet. The next post–and mind you, these all popped up within a couple of days–finds us finally in a vet clinic where a sedated–not anesthetized, there is a big difference–Achilles is getting an ultrasound. In the caption, Serio informs readers that his back legs each have incorrectly placed screws which have thus healed incorrectly, that he has extremely severe calcium deficiency, and two fractures in his left foreleg. On top of that he has gastritis. Despite the grievous condition of the cub, and the insurmountable complications he’ll face in the future dealing with three legs which cannot function properly, and cannot hold his weight as a cub, much less the weight of the 700 lb adult male tiger, Serio announces that he “expects to get him through surgery in around 10 days” (surgery for what is not specified) and “then, 6 weeks of war for Papa Bear controlling Achilles’ movements”. But “win” to what end? This entire situation is an exemplary manifestation of Eduardo Serio’s inconceivable egotism and narcissism. The timelines of the posts do not add up. He first says the animal will have surgery in 10 days, and then immediately says that they can’t take him to surgery yet. The posts went up on Instagram within 48 hrs of each other, yet he describes the animals pain and suffering in the first few, then in the last one tells us that the cub has been without pain meds for 40 hours. Has the animal been lying, unable to walk for 10 full days and they still cannot do surgery? Is Serio simply posting again and confusingly rehashing the fact that they can’t do surgery? What is the surgery even for? To fix the two fractures in the left foreleg? For something else? We don’t know the answer to any of those questions. The disjointed way in which Serio publicizes his “rescued angels” is not designed to convey factual information to the public, but rather to garner attention. Instead of secluding a badly injured and suffering animal away from attention and action, offering it peace and quiet, Serio puts it on public display, going so far as to force it to move just to show the viewers how much pain it’s in. Instead of being kept in a padded cage, on fluids, and monitored by medical experts, the tiger cub is lying on the floor of the same house where Serio keeps all of his other cubs. This is not animal rescue, this is animal abuse. On top of all of the above are the scientific logistics associated with the number of problems facing this young tiger. I’m an optimist, but I’m also a realist. Here is a cub who only weighs 10-15 lbs now, and is unable to walk. Three of his four legs are severely compromised, and from my own experience with animals who suffered extreme calcium and mineral deficiencies in their adolescence, I know for a fact that no matter how well he responds to treatment, Achilles will not ever have a normal skeletal system, nor one which is fully capable of functioning the way a normal skeleton would. These issues combine to create the perfect storm of infirmities. Fracture sites, particularly ones near the joint, or which have been fixed via implants, are notoriously prone to developing arthritis which will only serve to further deteriorate the bones. And Achilles has three out of four legs facing such a fate. The fourth, normal, leg will not stay that way, as overburdening of weight will cause it to quickly breakdown and develop similar issues as those already compromised. Achilles is looking at a shortened half-life wherein walking and moving around will cause him constant and unavoidable pain. This is presuming that he survives surgery, that infection does not set in, and that there are no other complications. If it were a pony, or horse, or even a large dog, I do not know of any vet who would recommend pursuing treatment. Not with such a grim outlook. I’m not saying that the cat should be put down, I’m saying that *if* Achilles’ injuries are as severe has Serio is describing them to be, the humane course of action would be euthanasia. The tiger cub cannot even stand, and we have only Serio’s word that it is eating on its own. Yet the videos will likely continue. Serio, for all of his accusations that other, genuine (GFAS accredited) sanctuaries, are “incapable of properly caring for their animals”, is more focused on using his animals to further his own greatness. Instead of quietly bringing comfort and a painless release to a tiger cub whose future will–regardless of whether he grows to adulthood–involve constant pain and crippling infirmities, Serio is choosing to keep him alive for the publicity that trying to save him will provide for Black Jaguar White Tiger. I’m not a veterinarian. But neither is Serio. He’s simply a wealthy narcissist that would rather look like a savior of animals than a rational conservationist. Making the difficult choice to select the course of action that is best for the animal, rather than the course that is best for yourself, is what animal husbandry is all about. You cannot save every animal, something that GFAS sanctuaries are all to aware of. And if you cannot with certainty secure a future of comfortable, functional existence for an animal, then you are not acting in their best interest to drag them through painful surgeries and prolonged discomfort. You are, instead, acting in your own best interest. Especially when you broadcast that arduous journey of suffering to millions of followers touting how you and you alone can save the animal. Eduardo Serio isn’t God. He can’t heal animals with love, as he repeatedly says. He cannot cure them simply by ‘rescuing’ them. And he cannot offer them comfort and safety when he uses even their most wretched pain to further his own fame. A rescuer is supposed to rescue things, not use them. Addendum: Here is the most recent video. Achilles is lying in an unnatural position on his back seemingly unable to right himself as Serio pets him. Serio continues to insist that the cub is improving but here is no proof of that in the video. I’m also putting in two screenshots depicting a recent bout of self congratulating that Serio posted. What is most concerning about the fact that Serio is comparing himself to Servitje is that Servitje built a massive conglomerate company (one that is a monopoly, controlling over 80% of all baked goods and bread in Mexico) which brings in around 8.9 billion dollars a year on profit. 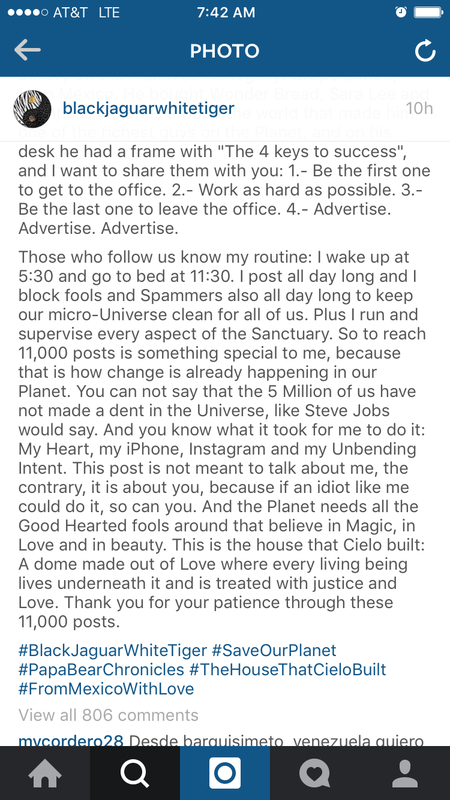 But Serio claims to be dedicated to rescuing his angels, not turning them into a source of revenue. Shouldn’t he be idolizing someone like Jane Goodall? Or Diane Fossey? 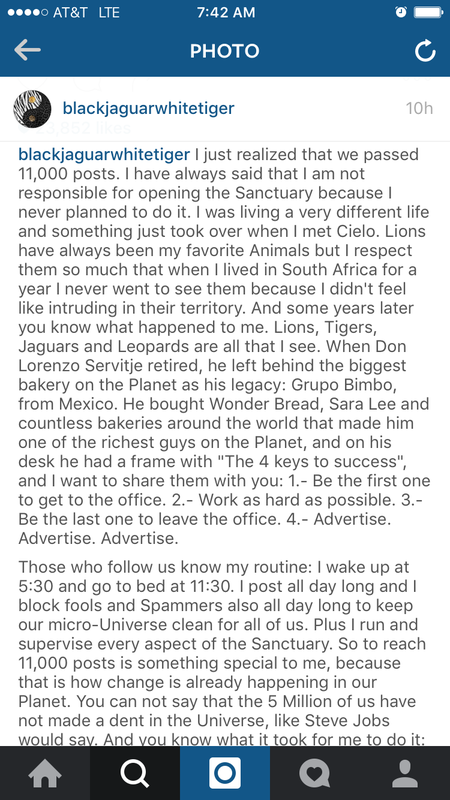 Some people might consider this nitpicking, but when Serio compares himself to a billionaire business man, including his own use of social media as advertising, I see nothing but someone who is building a business on the backs of exploited animals. This was posted today. Again, Serio claims that Achilles is doing “way better”. The general expression of the cub (walleyed, with pinpoint pupils) and the constant licking of his lips indicates otherwise. Posted today. Serio continues to claim that Achilles is improving. I continue to disbelieve him. There have been several more videos, and I haven’t linked to them because they all show basically the same thing, a crippled, despondent tiger cub with wide eyes and contracted pupils, non-reactive to stimulation. One video shows him licking-not chewing and swallowing, but just licking-a small piece of meat. Then, less than an hour ago, Serio posted this video, wherein Achilles is drinking water from a bowl. Underneath, Serio describes how Achilles is improving and even tried to stand but ‘his spine wouldn’t let him’ and that if not for his spine injury, he thinks Achilles could stand. Then he mentions the possibility of performing surgery on the cub to fix his (unnamed) spine injury. Was THIS the surgery Serio was mentioning in the earlier posts? Was Serio aware all along that Achilles was suffering from spinal trauma? Such an injury was never mentioned in any post, unless I somehow missed it. This adds an entirely new facet of difficulty to the survival chances of Achilles. Even hale otherwise uncompromised animals are euthanized due to spinal injuries, dependent upon the severity of those injuries. It’s been almost a week, and we’ve not seen any evidence that Achilles can stand, and no evidence that he’ll ever be able to stand. Yet Serio insists that “Papa Bear” is going to fix Achilles with the power of his love! Fifth addendum: It’s now been over two weeks since Achilles showed up at BJWT. I’ve stopped linking to every single video Serio posts, because there’s about 300 of them relating to Achilles. The one thing that every video shares in common is the fact that there has been no visible improvement in the tiger cub’s physical state. Serio has even mentioned yet one more newly discovered break in the only remaining undamaged leg. To recap, Achilles has multiple breaks in every limb, as well as throughout his small body, he has spinal damage and nerve damage and still cannot even sit up, much less stand. And yet Serio continues slapping up videos, calling on his followers to ‘think blue’ and heal the tiger cub with the power of love, just like Jim Jones beseeching his mindless followers to somehow eradicate the American government with the power of their minds. And just like the Kool-aid drinkers of the past, Serio’s followers are still drinking up his antics, exclaiming over how much better Achilles looks and how much he’s healing. Meanwhile, the tiger cub continues to suffer, hoisted in and out of the house on a wooden plank and used to further the reputation of an abuser no better than those who broke his tiny body to start with. Sixth addendum: It’s been some time since I updated, but here’s the latest vide of Achilles. Serio gushes about how he’s recovering from 10 fractures “one step at a time” but as the cub has had no surgery to stabilize any of the fractures, and Serio himself has stated that the incorrectly place pins in his hind legs are actually continuing to damage them, all I see is gross negligence and abuse, not hope and optimism. I’d like to begin by saying that in some ways I truly admire you. Perhaps we have different views on some (or many) social issues, but I do see in you a deep desire to be kind to others. You seem to put great effort into being a progressive and independent woman and a role model not only to entertainment-obsessed masses, but to the youth of America (this includes your young daughter). I think it was, perhaps, a mother’s love and the need to provide your daughter with extraordinary opportunities, that you, yourself, never had, that was the impetus behind what was an incredibly misguided, but well intentioned action. You and your husband brought your young daughter to Thailand and whilst there paid to have your family photographed while bottle feeding a tiger cub. No doubt in your mind this would be an image captured forever on film that would allow your daughter to look back on that family trip and say “Wow, how fortunate I was to be part of such a ‘rare’ experience.” What you did not know, and what I think, sadly, you still have not realized, is that while this experience was, indeed, amazing, it was also a form of animal abuse. One that does not occur only in Thailand, but all over the world. Sadly, the practice of ‘‘paying to play” is most prevalent here in the United States. What seems like a harmless encounter to humans is, in actuality, just one brief moment in a lifetime of misery and abuse for these cubs. Here in America dozens of traveling zoos and roadside exhibits make quite a pretty penny by charging members of the public to pet, play with, or even swim with adolescent wild animals. The most common victims in the ‘pay to play scheme, are cubs of the big cats. What the public doesn’t understand, is that the adorable babies they get to hold have been ripped from the care of their mothers, artificially orphaned, and thrust into a short life of suffering and abuse as nothing more than photography props. The inhumane treatment begins early on with the removal of the cubs from their mothers. At this vulnerable age their immune systems are not fully developed and the intense stress and exposure from constant handling puts them at great risk for disease or fatality. Unnatural habitats and prolonged photo sessions leave the cubs unable to regulate their sleep patterns, which further damages their growth. Forced to endure being passed around like merchandise and exposure to flashbulbs, some of them develop vision and limb problems. Many suffer the removal of their claws and teeth, in order to guarantee the safety of the customers paying to hold them. Others are starved in an attempt to stunt their growth, thus keeping them viable for use in ‘pay to play’ gigs even as they age. I will never forget the first time I watched a cub-handling encounter on YouTube. The way the handlers roughly grabbed them and hung them by their armpits to “reset” them, claiming that this is how they would be held in the wild, blowing in their faces to “calm” them down. Or the heartbreaking cries of protest from the cubs as they were tossed from stranger to stranger simply for entertainment value. As a mother, I am sure you can’t imagine letting anyone handle your child in such a way. The luckiest cubs will grow too large or too aggressive to be useful as photo props, and subsequently will be spared the prison sentence of a life in captivity. Instead, they will be sold for use in canned hunts. Taken to open land and released for a few precious moment before the bullet of a paying hunter puts an end to their short-lived joy. Others will be butchered outright, their body parts sold on the blackmarket. As I said, those animals are the lucky ones. Many ‘pay to play’ cubs will, unfortunately, become part of the exotic animal trade, an industry which is surpassed in profit only by drugs and guns. I share all this with you now, not to shame you. I know you have been slandered and criticized by many because of your actions. While I understand the anger that many people feel, what some fail to understand is that the fault lies not only on your shoulders. We must also blame a lack of education within our society. Fault also lies within our media. Commercials and television programs glorify the idea of turning wild animals into pets, and precious little attention is given to the vile underworld of animal trafficking and the abuse associated with ‘pay to play’ venues. Why has so little attention been paid to this horrendous form of abuse? Why is it allowed to go on legally in so many parts of our country and elsewhere in the world? Equally culpable are our lawmakers. At what point do we say, “We must change the laws that allow this to continue”? Ms. Carter, you did not create the industry that propagates this kind of abuse, but I ask you now to take a stand against it. Channel your inner Sasha Fierce and speak out on behalf of those who have no voice of their own. We need your help. The baby wild animals need your help. There is no shame in making a mistake, no matter how erroneous, if you acknowledge that mistake and embrace the change that allows you to become a more enlightened human being. I hope my words find you somehow through social media and that not only do they inspire you to instigate change, but that they help you realize that as human beings we are fallible. In the end you are not guilty of anything but remaining silent. Some places, like T.I.G.E.R.S., very carefully strategize and word their choices for photographs as by the group, meaning that each person in a group must pay to have a photograph, not of themselves with their cub, but of the entire group of paying customers with their cubs. Other places, often no more than private backyard zoos, give you the chance to hold and pose with cubs for just $20. Each place has its own guidelines and options and costs. I will post links to them so that you can see for yourself. Cubs cannot be handled before 8 weeks of age, because 8 weeks is the earliest point at which cubs can receive vaccinations. But the USDA defines a ‘juvenile big cat’ as being any cub over the age of 12 weeks and DOES NOT permit the public contact with cubs over the age of 12 weeks. Although the USDA laws should override any state laws, some states like Florida ignore the USDA regulations in favor of making their own. In Florida (where a number of cub petting operations exist) the public is permitted to handle cubs under the weight limit of 25lbs. This roughly translates to 12 weeks of age for the average big cat cub. However, Florida DOES NOT regulate the handling of cubs UNDER 25lbs, no matter how young they are. Here is a list of establishments that came up when I plugged in the search perimeters of “where can I hold a baby tiger?” into Google. Many of these are IN THE UNITED STATES. *Black Jaguar White Tiger does not advertise public visitations/pay to play (I’m being completely fair to them by pointing this out) but their name did come up near the top of my feed, revealing that they do top the list of responses of “holding baby tigers”. *The last three parks on the list are all owned by Karl Mogenson/his family. Now, according to the USDA, cubs can only be handled by the public for one month of their lives. Most of these sites do not list a specific ‘season’ for cub petting, it appears to be a service available year round. Presuming that the operators possess more than just one cub at a time, I went with estimating them to have 5 cubs. Some will have more available, some will have less. But, supposing they all have 5 cubs available to the public, year round, and supposing that they all follow USDA guidelines (as many insist they do) each operator will go through about 60 cubs a year. There are 18 operators on the list who offer cub petting publicly. So every year approximately 1,080 cubs are bred and handled by the public through these establishments. Minimum. Supposedly ‘for conservation’. Then you look at a group like T.I.G.E.R.S. which has been in operation since 1983, and even if they had only five cubs available to the public at a time, T.I.G.E.R.S. alone has gone through 1,980 cubs since it was founded. I say “gone through” because, well, where are these cubs now? That, is the million dollar question. Because the cub petting industry is regulated by only a few flimsy sentences, which can be routinely ignored without any notable consequence, the operators who provide cub petting services are in no way required to document where those cubs come from, or where they go when their 4 week shelf life is up. Likewise, zoos are not obligated to make public where their surplus animals disappear to. And this is just a small sampling of the available venues for direct interaction with big cat cubs. You could double or triple the numbers I’ve listed. We just don’t know, because no one is paying attention to how severe a problem this is. Not at the moment. I spent several hours slowly plowing through BJWT’s Instagram feed–so popular with his nearly 5 million followers–making lists of cubs by name, by ‘pride’, and then by where they are now. Needless to say, I had a difficult time tracking down just how many cubs BJWT has had in its possession, and how many it still has in its possession as adults. Serio himself claims to have personally bottle fed over 90 big cat cubs. I was able to come up with roughly 87 named cubs. Breaking that down over the three years that BJWT has been in existence (according to Serio) that’s roughly 7 new cubs appearing every four months. I say ‘roughly’ because Serio has a habit of changing cubs’ names, as well as nicknaming them with multiple nicknames. Thus, it took quite a bit of sorting to assure I wasn’t accidentally counting the same cats twice. Of the 87 cubs I counted, 6 can be confirmed as deceased. The causes of death, however, are not nearly as easy to pin down. Tatiana and Keiko both supposedly died of ‘collapsed lungs’ both incidents were attributed by Serio to ‘genetic defects’. Onix/Onyx died–again, according to Serio–of a ‘brain aneurysm’ which he also blamed on inbreeding. Labai died of what Serio described as ‘his intestines scratching his colon’ something Serio claims the cub suffered from with his prior owners due to improper feeding. Strangely, all of the pictures portraying Labai as a young cub were taken at BJWT and no mention of prior intestinal issues was ever made. Tibet is dead. That is all, I could find nothing else about him. Itzamna ‘didn’t make it’ which isn’t uncommon because ‘all ligers are born with genetic issues’. Let me remind you that even though Serio has lost so many cubs to “genetic” problems, he doesn’t believe in neutering or spaying because he wants to use his ‘kids’ to repopulate the wild. Of the remaining 81 cubs, 25 have “gone dark” and simply disappeared from social media. This doesn’t mean that anything has happened to them. I have no proof that anything happened, and I’m not asserting that something did happened. I’m simply stating that we don’t know where these cubs are now, because there is no accountability in taking thousands of photos and videos of people holding your big cat cubs and posting them to social media. Especially when you aren’t a GFAS accredited sanctuary, and have no oversight. And before someone comments, I know that Serio claims to have rescued all of the cubs in his care, and that he insists he’s never bred them. The fact is, he doesn’t have to breed his cubs, because he buys them from breeders all over Mexico, which does nothing but support breeding them for profit. There are other issues with Serio’s accountability, but this article isn’t the place to go into them. I listed the cubs here because he uses them to further the cub petting industry. No matter what Serio says he’s doing, what his actions show him to be, is someone who enjoys coddling with captive big cats, and who will allow his chosen guests to do the same thing. Someone who relishes his own celebrity for the act of cuddling with captive big cats. The point is, taking selfies, or regular photographs or videos, snaps, vines–taking any form of media with big cat cubs is a million dollar business. It is an epidemic, and it is continuing to spread like a plague. And until the public stops oohing and ahhing and starts demanding accountability, nothing is ever going to change. Feature Image Taken From Sriracha Tiger Zoo in Thailand, one more place that capitalizes on photos with captive big cats. If you’re at all familiar with ICARUS, and the articles we produce you know about our undying frustration with, and loathing of, groups like Black Jaguar White Tiger, who sensationalize the handling, and exploitation of animals while insisting that they do what they do for the betterment, and “conservation” of the very animals they’re exploiting. We tend to focus on BJWT a great deal simply because Eduardo Serio, its founder, goes to great lengths to secure contact with popular celebrities, from actors and actresses, to athletes, and the members of chart-toping musical groups, and then uses the photos of those celebrities holding his cats to further the popularity of BJWT on social media. His social media status has become a self-fulfilling prophecy, with little visible, or widespread objection. Those of us who speak out against Serio are few, and when compared to celebrities like Channing Tatum, Paris Hilton, or Lewis Hamilton, very small fish. Celebrity backing is one way that groups like BJWT continue to build their smokescreen of conservation on the backs of the animals they’re exploiting. But there is another way that pseudo sanctuaries, and pseudo conservationists build themselves up in public popularity while exploiting the animals they claim to be helping. Science. It’s far more insidious than Serio’s overt, and egotistical showmanship, and it occurs much, much closer to home. Tucked into the primordial forests of northwestern Oregon along the Columbia river you’ll find an exemplary example of both pseudo conservation, and pseudo sanctuaries: The Zoological Wildlife Conservation Center. Also called The Sloth Center. And the Sloth Captive Husbandry Research Center. Yes, all of those “groups” and titles belong to the same organization. According to their website, all three groups work “hand-in-hand” to support each other. While conservation organizations often work together to support their endeavors into protecting various species of animals, the blurred lines between the ZWCC, TSC and the SCHRC smack more of a shell game than they do of cooperation and alliance. Although this trio publicly present themselves as being wholly devoted to the conservation of the species they house, the truth is somewhat more muddled. It does not help that one of their primary objectives–they say–is researching captive animal husbandry so as to better the practices of keeping captive exotic animals in the future. This sounds very responsible and forward thinking, but under scrutiny, it falls apart into nothing more than an excuse for owning, exploiting and capitalizing off of, captive wild animals. As of the publication of this article we have been unable to find where any of the three groups has published, or produced any papers, or other representations of their research, as one would expect of a scientific research group. If they are researching captive animal husbandry, they aren’t sharing what they’ve learned, and thus are not impacting the plight of captive exotic animals in any meaningful way. Beneath that, is the statement: ZWCC & TSC is NOT a for public entertainment “zoo” and only offers guests access through seasonal guided educational programs. It is important to differentiate between the statements of the groups because that attention to detail is how groups like these get around things. While neither the ZWCC or TSC are “for public entertainment” they do offer multiple chances for the public to interact with the animals in their care. Lifetime care for all animals. See, e.g., Global Federation of Animal Sanctuaries Accreditation Standards; see also, 16 U.S.C. § 3372. ZWCC, TSC and SCHRC, as I will explain below, do not meet these threshold requirements. Indeed, they breed animals, sell animals into private ownership, and allow the public to handle animals on the premises. They are not accredited by GFAS. On their website there are six programs listed that the public can select, each for a price. The Carnivore Encounter, the Primate Encounter, the Join The Pack With 2015 Pups (wolf experience) the I Kissed a Sloth… and I Liked It, the Sloth Sleepover+Seasonal Bonus, and Sloth Feed & Pet Educational Encounter. Of these, the first three (Carnivore, Primate, and Pack) programs now have a short statement beside them that reads: Due to revised Federal regulations governing guest contact with wildlife species, specifically carnivores, this program is no longer available. Sadly, we foresee these regulations affecting all wildlife species in the very near future. The primate encounter is altered to say ‘specifically primates’ but is otherwise identical to the other two. The ZWCC, TSC and SCHRC are very keen in blaming the Federal government and its unfair oversight on their inability to provide the public with learning experiences, and use the possibility of losing the ability to allow the public to handle their animals as a push to hurry and make reservations while that option is still allowed. But despite these statements in regard to some of their programs, there has been feedback from visitors left on the ZWCC, TSC and SCHRC website as recently as January 17th of 2016 citing the wolf encounter specifically and touting the wonders of it. Whether or not the public is currently allowed to have contact with the carnivores is something we weren’t able to confirm. It is quite possible that the experiences are no longer publicized, but might be offered for an additional fee once a guest is onsite. A sort of “on the sly” offer. Or, in all fairness and objectivity, it might be something that truly is no longer available. 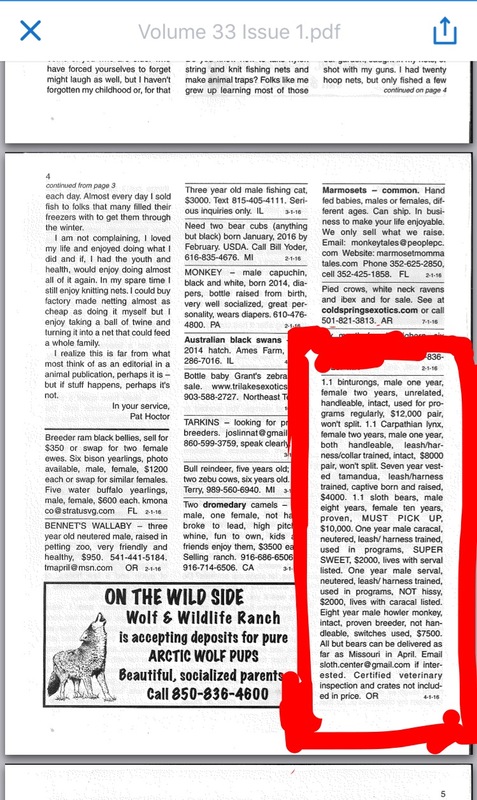 If the ZWCC, TSC & SCHRC really are doing away with their carnivore, primate, and other hands-on activities, it might explain a recent ad, the contact for which is sloth.center@gmail.com, that can be found in Animal Finders’ Guide, Volume 33, Issue 1 of February 1 2016. Animal Finders’ Guide is a publication that, through classified advertisements, caters to the exotic pet trade, canned hunting ranches, and taxidermy auctions. Not the conservation of wild animals, but rather the ownership of exotic animals as privately owned pets, profit-generating tools, hunting trophies, or taxidermy. Animal Finders’ Guide was conceived and started over 30 years ago by my wife, Sharon, some friends, and myself, Pat Hoctor. We started this publication for two main reasons. It was nearly impossible, at that time, to obtain the information to humanely and profitably, captively raise wildlife. The second major reason was the drastic difference in prices of animals throughout our country. This made it hard for breeders to show a profit. We felt that those raising these animals must make a profit so that they might be able to continue. Since the world is loosing natural habitat daily, it is our belief that the last hope before extinction for many animal species is captive breeding. We are extremely dedicated to the concept of small, family farms. It is my opinion that this is the “great American dream” – a little place in the country to call our own where you can make a living, surrounding yourself with nature and family. We believe the most important crop raised on family farms is the children who grow up to become honest, hardworking, caring citizens, loving family and nature more than themselves. Sharon and I have raised hundreds of exotic cats such as lions, tigers, ligers, cougars, leopards, jaguars, bobcats, servals, jungle cats, caracals, and many others. We have raised several hundred rare sheep such as Shetlands, Black Welsh Mountain, mouflon, and barbados. There have been many other species raised on our farm such as sika, whitetail, fallow and muntjac deer, Sicilian donkeys, mules, and horses. There were belted Gallaway, Scottish Highland, and Irish Dexter cattle. There were many primates such as pygmy and common marmosets; cotton top tamarins; ringtail, brown, and red lemurs; celebese, liontail, stumptail, rhesus, and snow macaques; hamadryas and olive baboons; several types of capuchins; squirrel and spider monkeys; Singalese and greater galigos, and DeBrazza’s monkeys. We have had kinkajous and binturongs, wolves and wolf hybrids, coyotes and fox, llamas and guanacos, pygmy goats, India blue peacocks, swans, geese, ducks, and many types of reptiles, fish in fifteen ponds and lots more species of wildlife too numerous to mention. We have been there and done that! For several years I acted as a broker and dealer, relocating and transporting animals to new homes from zoos and importers. Thousands of these animals are now happy and reproducing. Notice that the Sloth Center is not included in that statement? There’s a reason for that. Each of the “groups” have their own statements, and there is a carefully structured safety net, if you will, in doing that. The email address in the Animal Finders’ Guide ad is sloth.center@gmail.com. This is also the email address for The Sloth Center, which is convenient because that group is specifically not listed in the header declaring that no animals are sold to the public. But it is also the email address that appears when one clicks the “email us” button on the ZWCC Facebook ‘”about” page. Is this “splitting hairs”? Perhaps. But in a court, splitting hairs is often the difference between a fine, jail time, license suspension, or any legal retribution at all, and no action being taken against a group. Below is a screenshot of the ad as it appears on page 4 of the AFG. I will attach the entire issue of the AFG at the end of this post in a PDF format. The ad is in the bottom righthand corner, and lists several animals–including unfixed pairs and “proven” pairs for breeding. There is nothing to link the ad to the ZWCC, SCHRC or TSC aside from the email address, sloth.center@gmail.com. That is the nature of those who traffic in exotic animals. Names, or real names, are never provided, little traceable information is exchanged. Often, payments are made in cash. Listings show that the facility is seeking from $2,000 to $12,000, for a variety of species, including primates, exotic cats, and bears. This is blatant evidence that at least one of the three groups associated with the address 74320 Larson Rd, Rainier Oregon is actively advertising multiple exotic animals for sale to the public. And it’s not the first time there have been accusations of the ZWCC, SCHRC or TSC selling their animals. At least on reviewer claims he bought an animals from them, and here is an article citing the estate sale of Wayne Newton in 2013. At least 280 exotic animals which comprised the estate were sold to the ZWCC “for rescue”–but two of them were two toed sloths which had originally come from the ZWCC and somehow ended up in Newton’s private zoo. It was not made clear whether Newton had purchased those sloths, or how they had come into his possession. But it is an acknowledged fact the they did belong to the ZWCC originally, and they got into Newton’s private zoo somehow. Above and beyond this gross negligence and blatant exploitation of animals in a for-profit venture of breeding and selling them, they are duping the public into believing that it is a legitimate sanctuary doing important species conservation work. If those facts alone aren’t enough to make you reconsider America’s “favorite sloth sanctuary” we’ll leave you with a few photos taken directly from the ZWCC Facebook page. Because we’ve taken the photographs from the ZWCC’s public Facebook page, they cannot claim any expectation of privacy. However, we have blocked out the faces of those within them to maintain their personal privacy. Several of the photos are of underaged females, and their privacy is of the utmost importance to us, even as the photos reveal the true nature of the ZWCC, SCHRC and TSC, and their “conservation” practices. “Join the Pack” and spread zoologic diseases between species while you’re at it. Nothing says “conservation” like a serval wearing a purple collar in someone’s bed. Extra snuggles for (actually) highly endangered snow leopard cubs! Because there’s no chance that an animal capable of killing small deer could in anyway be a danger to a child. More people becoming one with the pack. Every tamandua should know how to walk on a leash. Meet and greet with predators. Teaching children where wild cats belong. On leashes and as pets! Or lounging in living rooms, because that’s totally similar to the Himalayan mountains. When stalking and preparing to attack prey is just too cute to ignore. There is no way for us to know exactly when these photographs were actually taken. It’s possible that some of them were taken before the recent edition of the “Federal changes say we can’t let you touch animals” alterations to the listed programs. However, the very fact that they were taken, is irrefutable evidence of how much emphasis the ZWCC, SCHRC and TSC puts on the handling and exploiting of the animals in their care, which directly contradicts their statements that they are not about entertainment and public interaction. Animals are, apparently, regularly handled from birth to adulthood, allowed into occupied dwellings to interact with domestic animals and share the space with humans, trained to walk on harnesses, and handled by children–despite the grave and inherent risk in allowing top tier predators–even small or young ones–in direct contact with humans. This is what the ZWCC, SCHRC and TSC is all about. Not research, not conservation, and not public education. Unless, that is, you find teaching the public erroneous information to be education. Eduardo Serio claims that his own interactions with his big cats, and the fact that he allows the public to play with them, is simply a way of “raising awareness” about the plight of wild animals. Many pseudo sanctuaries, and pseudo conservationists, use this declaration of “raising awareness” as a shield against their exploitation of animals. What does it matter, they argue, if one does things that are not a great idea, if those things grab the public’s attention, and “gets them involved”? In reality, experts have found that exhibits that facilitate close or direct contact with exotic and endangered species actually lessen public interest in conservation because they send the message that animals are easily accessible and not seriously imperiled in the wild. It makes one wonder how those pseudo conservationists would feel if they were injured and called 911 only to find out that their First Responders didn’t *actually* know lifesaving first aid and rescue techniques? What if, in an effort to “get more people involved” and to “raise awareness” about how to respond to medical emergencies, we put on camps and educational seminars wherein the attendants were taught how to perform CPR just like the actors on their favorite hospital sitcoms? Or how to rescue people trapped on mountaintops just like their celebrity heroes in the movies? Instead of how real paramedics, firefighters, and doctors do it? Don’t roll your eyes. This is exactly what pseudo conservationists are teaching the public about wild animals everywhere. In the world of conservation, we, the public, are the first responders when animals are in trouble. It is our responsibility to care for them in a respectful and conservational manner, and to, when needed, contact professional rescue groups, or sanctuaries, to help in the rehabilitation and release of animals back into the wild. But instead of teaching the public, and younger generations, true “life saving techniques” pseudo sanctuaries and pseudo conservationists like ZWCC, SCHRC and TSC, and Eduardo Serio at BLWT, and every other direct-interaction place, is teaching the public and younger generations that it’s okay to have wild animals as pets, that it’s okay to keep them in your homes, and that it’s okay to treat them like they’re oversized domestic animals–as long as you claim that you’re doing so to “raise awareness” or “get other people involved” or “to research captive husbandry”. It doesn’t matter that the only way in which all of those “other people” will get involved is to go buy their own wild animals to keep as pets. In some instances, it’s unavoidably necessary to maintain captive wild animals, but with millions of exotic animals being kept as pets in the United States alone, and with the exotic pet trade bringing in billions of dollars each year, the last thing we need are “conservation” groups who openly breed and then secretly sell more exotic animals into the system. Please, no matter how popular a tourist destination involving animals is, do a little research on them first. If they allow direct interaction between the public and the animals in their care, if they actively breed and sell animals, they are not a group with conservation in mind, no matter what they might say. Here is the PDF file of the Animal Finders’ Guide. In recent years, selfies have become a global phenomenon. Worse, they’ve become a leading cause of accidental death for people all around the world. By some estimates (arguable, but still) the taking of selfies now causes more deaths per year than shark attacks. As disturbing as this is, it thus far has remained a sort of self-inflicted death sentence, an encapsulated phenomenon affecting only the humans taking the selfies. Just in the last few weeks, a rare adolescent La Plata dolphin was killed when it became disoriented and beached itself. Instead of taking the animal back out into the surf and releasing it, hundreds of people began holding it aloft, and passing it around, all vying to take selfies with it. The dolphin quickly succumbed to shock and dehydration and died. After its death, the body was discarded on the beach, and–after a few more selfies with the corpse–it was left to rot. No charges have been filed in this case. A man in Florida pulled a small bull shark out of the ocean, dragging it up onto the beach by its tail and then posing with it while onlookers eagerly snapped photos. Though the man eventually returned the shark to water, it reportedly sank out of sight without beginning to swim on its own, and it’s not known whether the shark managed to survive, or died of its injuries. In China, visitors at a wildlife park–after being explicitly told to leave the birds within alone–not only grabbed several peacocks off the ground, but then pinned them against their chests while they took multiple selfies with the birds. Unlike humans, birds do not have a diaphragm, and they must rely on the expansion and compression of their chest cavities in order to move air in and out of their bodies. Pinioned tightly as they were, the peacocks were literally suffocated nearly to the point of death. What lack of oxygen began, shock finished, in the case of two birds. Both died shortly after the incident. Now, a swan in Macedonia has become the latest victim of the ‘selfies with animals’ craze that’s sweeping the internet. Acclimated to the appearance of tourists, the swan did not shy away when a Bulgarian woman approached. Had the swan fled, it might still be alive. Instead, it allowed the woman to get close to it. She then grabbed the bird by one wing, and dragged it thrashing up onto the embankment. It’s likely that the swan’s wing was injured by the rough handling, but it was shock that killed it. Once the tourist got her selfie, she abandoned the bird on the beach where it quickly died. These are isolated incidents which have made Internet news forums and have been highly publicized. Still consistently overlooked in the game of animal selfies, is the million dollar industry of cub petting, and cub selfies, which relies both on the continued breeding of captive big cats, and the public’s belief that it is their right to take selfies with these animals, and their right to exploit them “just this once” in order to create a memory for themselves. This widespread entitlement that the public at large embraces, is something fueled, at least in part, to our consumption-based society. Terms like “white privilege” and “male privilege” are commonplace within today’s discussions, but I’m going to add a couple more to the roster. “Human Privilege” and “First World Privilege”. “Human privilege” can be applied to situations like those above, where anyone, no matter their monetary status perceives themselves has having the right to impose upon the animals they encounter in order to satisfy their own interests. We don’t go around picking up other peoples’ babies or children and taking pictures of ourselves holding them simply because they’re cute, and we want a photograph with them. Likewise, we don’t walk up to strangers and hug them while taking photographs of the interaction. People who jump into the path of celebrities only to snap photographs are considered to be assholes, even during their few moments of fame. But humans think nothing of snatching animals up and forcing them to participate in interactions which are then documented in a photo or selfie, and subsequently splashed across the internet. Often, the more unlikely the animal companion, or the more dangerous the situation, the more popular the resulting selfie becomes. “First world Privilege” is applicable to any situation in which someone is monetarily able to provide themselves with disposable goods, but for my purposes, I’m applying it specifically to those who pay to hold, pet, and take selfies with captive wild animals which have been bred specifically for that purpose. Pseudo sanctuaries (which are not GFAS accredited sanctuaries) like Black Jaguar White Tiger, T.I.G.E.R.S., Dade City Wild Things, Virginia’s beleaguered Natural Bridge Zoo, the Zoological Wildlife Conservation Center, and many other establishments, exist on the dollars pulled in by charging the public to hold and take selfies with their animals. The exploitation of their animals for use in public photos and selfies is not a footnote within the operations of the aforementioned pseudo sanctuaries, it is the very foundation on which the businesses were built, and on which they continue to stand. Egregious institutes such as the Tiger Temple, exist solely to cater to the “first world privilege” of those who pay to use their services while vacationing. If monetarily possessed people refused to pay to be allowed to hold and take photographs with captive wild animals, the consumption would end, and the practice would as well. After all, such fads as paying for seances has largely died out. Now, if someone pays for the services of a psychic, the mainstream public sees it as a waste of money. But once, it was considered to be *the* thing to do. So what can you do to help end this “selfie with animals” epidemic? Well, for one, check out anti-animal selfie movements, like Big Cat Rescue’s Tiger Selfie and educate yourself. Then, stop sharing wild animal selfies and photos on Facebook, and other social media sites. Black Jaguar White Tiger is the leading power behind the public’s obsession with sharing, and celebrating, photographs, videos and selfies of celebrity guests holding and coddling captive wild animals. Though closed to the public (you must be invited in, and/or donate $1,000 or more a month to be allowed onto te property) BJWT uses its 5 million+ followers on Instagram to promote activities like holding, playing with and keeping as pets, captive wild animals, big cats in particular. Eduard Serio defends himself, and his own actions insisting that his animals are not exploited and that he’s raising awareness about the plight of animals everywhere, and always hashtags the photos with #notpets despite that he’s blatantly treating the animals just like pets. The photos he promotes are those wherein he, or his many celebrity guests, are holding and playing with the animals kept on his property. These photos are subsequently liked, shared, and re-shared thousands and thousands of times. BJWT is beloved by millions, as I’ve said, and despite that the BJWT website recently, and without explanation, removed the ‘visit for two’ benefit to donating $1,000 or more a month (suspiciously after a number of articles publicly pointed out the fact that the chance to play with the animals was being used to garner donations) those millions of followers remain devoted to the pseudo sanctuary and its celebrity visitors. Yes, the fans love BJWT. Problem is, only a few people ever get to go to the secretly guarded BJWT facility and “share Eddie’s special bond” with his pets–excuse me, “rescued” animals. So what’s an average Joe to do? Visit a more accessible “sanctuary” like T.I.G.E.R.S. or Natural Bridge Zoo(neither of which are GFAS accredited) where for what passes for today’s pocket change will get you some cuddle time with captive big cats who have been bred just so people like you can pay to get cuddle time with them! Or, if you’re more into the offhand encounters, you can head out into the countryside and start randomly grabbing and manhandling whatever sort of animal you come across. It bears pointing out that not *every* selfie in which and animal has been forced to participate actually looks like the animal has been forced, or is suffering. Some animals aren’t capable of defending themselves against unwanted attention. Sloths, and even animals like the Northern opossums, or common turtles are more inclined to simply go limp or freeze when trapped by a human. You can literally walk through a South American jungle and pluck sloths from the trees (if you can reach them) and the sloths won’t do anything to you. But that doesn’t mean you have the right to touch a sloth. So the next time an oh-so-cute photo of someone coddling or hamming with a wild animal pops up in your news feed, take a moment to look at it closely before simply liking and sharing it. All of those likes and shares promote the activities shown in the photographs and videos so it’s vital to understand what you’re promoting. Does the picture portray a celebrity at a “sanctuary” that is not GFAS accredited, and allows direct interaction between the public and its animals? Does it have a caption that somehow links the activities of holding or playing with the animals to conservation or awareness? Are the animals in the photo wild, or not the sort of animals you would ever expect to see in human hands? If the answer to any of these is “Yes” then more than likely the animals in the photographs are being exploited. Only in cases wherein medical attention, or nutrition is being administered by accredited professionals is it acceptable to hold or manipulate a wild, or captive wild animal. As tempting as it might be to scoop up a baby animal (or adorable adult, or awesome looking animal) for “just one photo” you have to understand that your actions will have an impact on that animal, and that animals do not perceive such things the way a human might. For them, being held against their will is emotionally, mentally, and sometimes physically, damaging. And in some cases while people rationalize their actions by looking at it from the standpoint of “it’s just one photo” for the animals–depending on their situation–it might well be their hundredth, or thousandth photo. In cub petting situations, while you get a few minutes (maybe more, depending on what you pay) with a big cat cub, that cub often has to spend “a few minutes” with hundreds of guests each day. The same goes for animals such as the peacock killed by tourists in China, and the swan killed by tourists in Macedonia. Those animals had to deal with hundreds, or thousands of tourists passing through where they lived on a daily basis. And, chances are, they probably had to deal with people chasing, catching, or trying to catch them on a daily basis. We’ll never know if theses incidents were the first time the animals had been captured for photographs, or the hundredth time, because activities like this aren’t monitored, or noted. In fact, the only attention and exposure this kind of abuse gets is after an animal is killed in the process. So I implore you, don’t be part of the epidemic of animal selfies. Do your research and be part of the cure.